If you have tried sending a package to someone, you have probably been asked whether you’d like to send it via certified mail or registered mail. What do these terms mean? And how are they different? In this article, we will explore the difference between these two types of postal service. Certified mail is a special type of service by United States Postal Service (and by postal services in other countries) which requires the delivery personnel to acquire the signature of the recipient or his or her representative upon delivery. If the package is not successfully delivered, the mail is returned to the original sender. When you send a package via certified mail, you will get a 20-digit numeric tracking code which typically starts with number “7.” Packages sent by Certified Mail are delivered within 5 business days. Certified mail is beneficial when you need proof that your package or letter was indeed sent, or that the delivery was successful or at least attempted. Tracking the package can be done electronically at the USPS website using the tracking number or by simply calling them. Return Receipt service – If you add this option, a mailing receipt with the original signature or its digital copy will be sent to you. Return Receipt After Mailing service or Duplicate Return Receipt service – You can purchase this if you had not purchased the Return Receipt service but would still like to get a copy of the recipient’s signature. Insurance and Collect on Delivery, however, are not available with certified mail. On the other hand, registered mail is a type of postal service by United States Postal Service (and by postal services in other countries) that includes a proper chain of custody, providing an extra level of protection and security to your item. You have the option to mail your items in locked containers, safes, or cages. The items are protected at every stage. 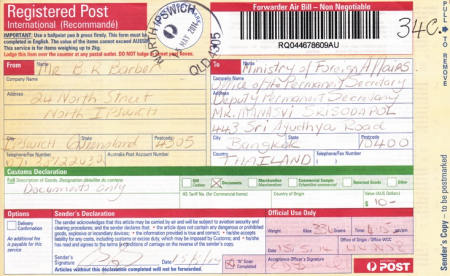 At each stage, the details of the package are logged in a register (hence the term “registered mail”). This option is preferred when you are mailing a valuable item which cannot easily be replaced. When you send a package via registered mail, you are given a 13-digit alphanumeric receipt number which typically begins with the letter “R.” Packages sent by registered mail may take up to 15 days because of the added security procedures. Insurance – The maximum insurance coverage is $25,000. The delivery may take up to 21 days. Collect on Delivery – Mailing may take up to 45 days. Return Receipt service – The sender will get a copy of the recipient’s signature. 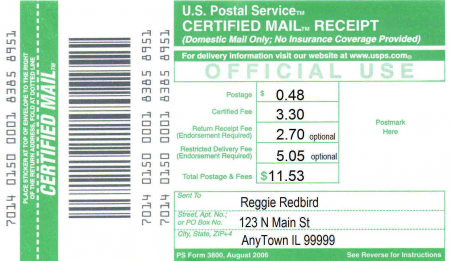 Return Receipt After Mailing service – The sender can purchase this if he had not purchased the return receipt service but still needs a copy of the recipient’s signature. Restricted delivery – A service that ensures only a specified person or an authorized representative will receive the mail. What, then, is the difference between certified and registered mail? Certified mail is a type of postal service that requires the delivery personnel to get the signature of the recipient or his or her authorized representative upon delivery. It is recommended when your primary concern is the proof of delivery. On the other hand, registered mail is a type of service that includes a proper chain of guardianship, providing an extra level of protection and security to your mailed item. It is preferred when you are sending a valuable item which cannot easily be replaced. The certified mail tracking code is composed of 20 numbers and usually starts the number “7.” The delivery takes up to 5 days. The tracking code for registered mail is composed of 13 alphanumeric characters and usually begins with the letter “R.” The delivery takes up to 15 days. Additional services such as Return Receipt and Return Receipt After Mailing are available in both postal services. However, only registered mail offers insurance and Collect on Delivery.